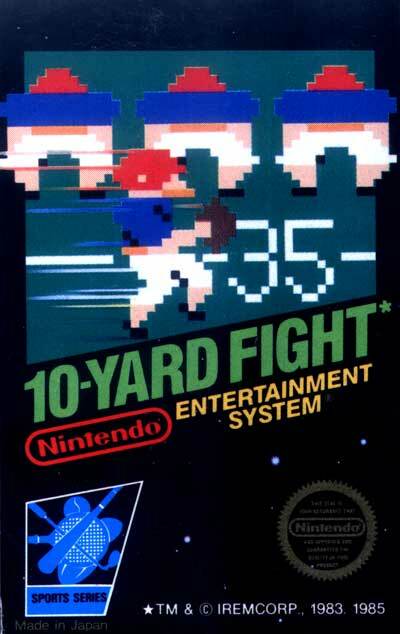 American Football, the intense game where muscle, brains, and passion collide... brought to lifelike realistic action, for the first time on your Nintendo Entertainment System. Well... sort of. Whether playing alone, or watching, you can't help but become overwhelmed with an urge to assemble into a donut formation and take to the gridiron. Defense is ready to stop you with as many as 183 starting formations and as many as 133,407 plays. Don't get caught with your shoulder pads on backwards! The game gradually gets harder as you progress. You start playing high school, then college, then pro, then play-off, and finally Super Bowl level. Come up with game-winning strategies and nice moves for both offense and defense. Part of the original sports lineup in Nintendo's "black box" series.